What If a Team Never Ran? The relative merit of passing and running has been an ongoing debate for generations. Early attempts to quantify the risks and rewards of the two general tactics did what they could using yards as a measure of effectiveness, but they could never fully account for the all the situational factors and outcome variables. How to account for down, distance, field position, sacks, turnovers, penalties, first down conversions, and so on made the problem too complex. And that’s before we even start to think about score and time. Since 2008, EPA and WPA has allowed us to account for all the primary situational factors while boiling all the outcomes into a single measure. We can also measure variance, an important consideration in game strategy. This analysis produced a complex result in which it appears offenses run too often in most situations but pass too often in others. But those models can only answer questions within the box of what teams already do. They can’t consider what would happen when a team operates outside the boundaries of what has already happened in the past, at least not directly. For example, we could never estimate how often a hypothetical team would win by always passing and never running, which is probably something a team like the 2014 San Diego Chargers should at least consider. Going into week 9 the Chargers average 0.33 EPA per pass (3rd in the league) but -0.09 EPA per run (29th). That’s an enormous difference—roughly a half point per play. In effect, every time the Chargers chose to run rather than pass they cost themselves nearly half a point. For twenty carries in a game, that’s a disadvantage of just over 8 points. Those numbers may be unrepresentative of the Chargers’ true average expected production due to sample error or uncaptured situational variables. 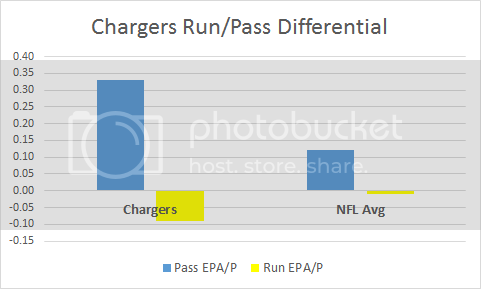 However, although the Chargers have only played 8 games this season, those EPA averages are from several hundred plays, so perhaps they are more representative than we might think. But even if we say those numbers are extreme, a regressed 4 or 5 point disadvantage would still be very large. That’s the equivalent of forfeiting over a 10% chance of winning a game. So what would happen if a team were to never run the ball? I created a version of the WOPR game simulator to find out. Normally the sim pitches two perfectly equal, league-average teams against each other. Both teams share identical, highly conventional tactics and strategies. But for this excursion, I programmed one team to always pass. How often that team wins, compared to its normal 50% win rate, might tell us the value of only passing. If only it were that simple. The sim can tell the offense to always pass, but it can’t tell the defense to know to always expect a pass. Passing outcomes can be very different when a defense knows what’s coming. However, we can use some cleverness to trick the sim into telling the defense to expect a pass. We can do this by telling it that it’s always 3rd and long for the purposes of generating play results, regardless of the actual down-distance situation. The play outcomes in the simulation would be drawn from the distribution of 3rd and long plays rather than the actual down-distance distribution. There would be many more sacks, strip-sacks, interceptions, and fewer completions than if defenses had to respect the threat of the run. The only exception to this rule would be on the goal line, when there are no 3rd and long outcomes to draw upon. The sim would still pass, but it would accurately know the distance to gain. I think this may penalize our pass-happy offense too much. After all, many situations would be less severe than 3rd and long, allowing them to make better risk-reward trade-offs. On the other hand, the real-world 3rd and longs still have at least a trace of probability of a run which defenses would need to respect. Additionally, 3rd and longs can result in relatively easy short yardage check down completions that end short of the line to gain. But on net, I’d bet a coach would say that a team transparently acting as if were 3rd and long on every play would have almost no chance of winning. That’s all they ever seem to talk about before games—take away the run early, force them to be one-dimensional, make them to beat us with [quarterback X]’s arm, and so on. This essentially turns the game into something more like the way people play flag or touch football. No one tries to inch their way toward a first down, attempting to set up ‘manageable’ third downs. They see a series as three tries to get all 10 yards (or past the tree or mailbox or whatever) on a single play. The best distance to go on 3rd down isn’t 2 yards or 1 yard or even inches to go. It’s no yards to go, because you already converted on 1st or 2nd down. So how does our pass-happy team do? With a typical run/pass balance, they win a perfectly even 50% of the time. The pass-only strategy wins 54.0% of the time, turning a 50/50 contest into a 54/46 contest. What if we allowed some wise exceptions to our pass-only rule? If we allow them to run only inside the opponent’s 10 yard line, they won 54.8% of the time. I bet if we could add some other common sense exceptions the pass-happy team would win even more often. As you might expect, the effect is even stronger if our pass-happy team finds itself behind its conventional opponent. Starting the second quarter down by a TD, a conventional team wins 29.9% of the time while our pass happy team wins 34.7% of the time. At first that appears to be roughly the same effect size as for a game that begins tied, but remember a quarter of the game has already passed. In case you think this is just a marginal improvement in win probability, consider that the odds go from 1:1 for the conventional run/pass balance to better than 1.2:1 for the passing strategy. This is with the same exact team—same players, same talent levels, just a different mindset. I'm not claiming a typical team would win exactly 54.3452345% of the time, but I would submit that a typical team would win significantly more often if they reserved most of their runs for particular situations. But San Diego is not a typical team. Because they are a much better passing team than running team, their benefit of forgoing the run entirely might be considerably better than 54/46. Our earlier back-of-the-envelope analysis conservatively estimated their running costs them 10% win probability per game, so a pass-only policy might buy that 10% back while adding more than the 4% benefit a typical team would enjoy.